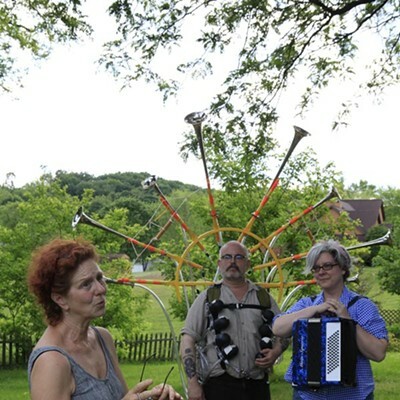 Squonk Opera's Steve O'Hearn (left), Jackie Dempsey and Anna Elder rehearse for GO Roadshow. Like many good new ideas, this one is really an old idea. 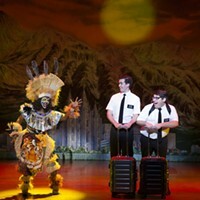 The inimitable Squonk Opera's latest extravaganza harks back both to the group's own roots and to an earlier era in public entertainment. 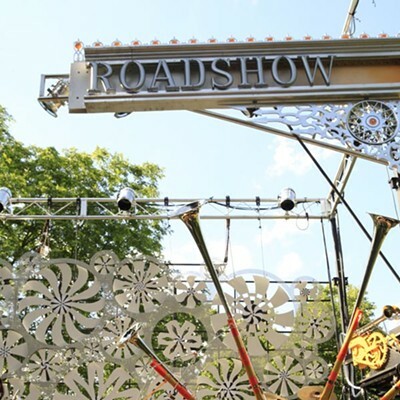 GO Roadshow is a musical street spectacle on wheels. The six-piece art-rock band/performance troupe has retrofitted a 13-ton, 38-foot-long flatbed truck — the kind that hauls construction supplies — as a rolling two-story-tall stage, complete with lights, sound system and the far-out mechanical props Squonk has become known for in its 20 years. 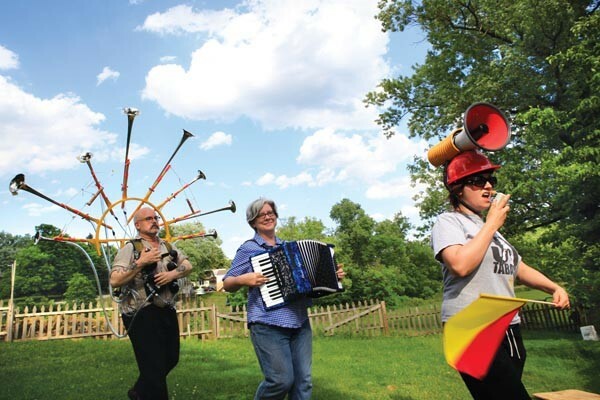 This carnivalesque, 45-minute cavalcade of spinning instruments, funny hats and cheerful rhythmic and melodic bombast — plus a blimp with a face and working jaw — debuts with six performances Downtown, at the Three Rivers Arts Festival. The June 8 premiere directly follows that night's festival main-stage performance by the Carolina Chocolate Drops. 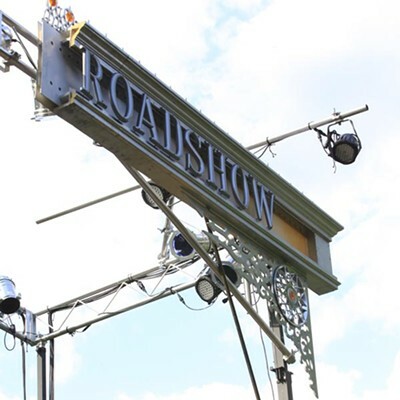 The show's uniquely mobile nature will also facilitate a summer-long series of 20 free outdoor concerts in Pittsburgh, presented by partners including Citiparks and the Pittsburgh Parks Conservancy. 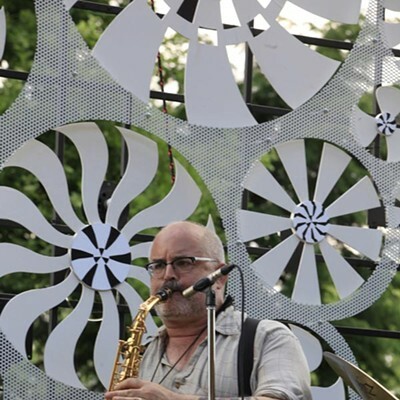 Venues include Lawrenceville's Arsenal Park, Highland Park and Oakland's Schenley Plaza; funders include the Pittsburgh Foundation's Fisher Fund, the National Endowment for the Arts and the Heinz Endowments. 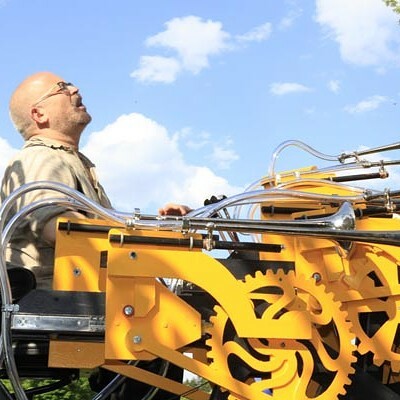 Squonk, which has performed internationally, on and off Broadway and around the U.S., has already booked GO at fairs or festivals in Morgantown, W.V., Baltimore and Cleveland. GO recalls how Squonk started out. 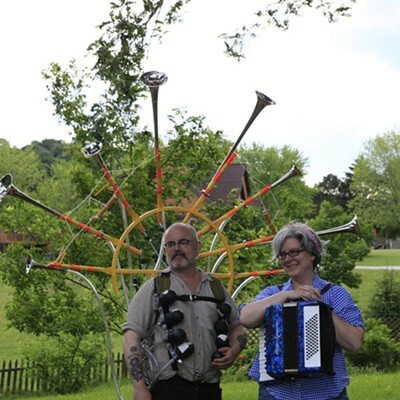 Co-founders Jackie Dempsey and Steve O'Hearn staged the troupe's first big melding of music and performance art outdoors, in a junkyard, and Squonk sometimes performed in venues like the now-defunct South Side Summer Street Spectacular. 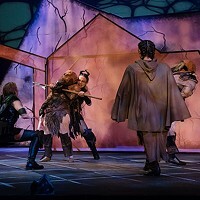 Eventually, Squonk moved mostly indoors, for shows like the Greek-myth-as-Western-spoof Rodeo Smackdown and its surrealistic 2000 foray onto Broadway, Bigsmorgasbordwunderwerk. The seeds for GO were planted a decade ago. 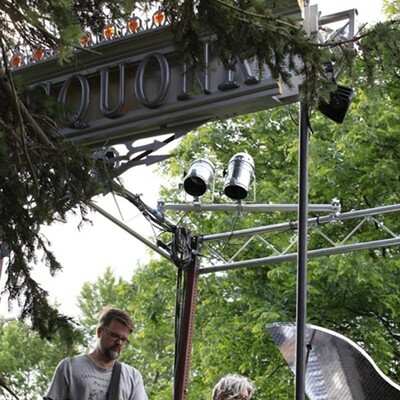 "We were remembering how fun it was to perform for an audience outside," says O'Hearn, during a break in rehearsals at his West Deer farm, which doubles as Squonk headquarters. Meanwhile, he says, at traditional theaters, dwindling audiences were making for more conservative, less Squonk-friendly seasons. Squonk's 2008 science-fiction sendup Astro-rama (which toured nationally) was staged outdoors, and for free. But the totally self-contained GO can be set up in a couple of hours, whereas Astro-rama, with its giant satellite dish and multiple video projections, takes two days or more. That pop-up quality connects GO to such slices of vintage Americana as "traveling circuses, Shriner and holiday parades, medicine shows, and used car lot events," as O'Hearn puts it. "This is a little more like when we started out ... that kind of feel of anybody coming, any age group, you don't have to pay any money to get in," says Dempsey. It all starts with the truck, a diesel-powered 2007 International that O'Hearn and Squonk technical director Todd Nonn bought for $30,000 in Virginia. Nonn set about making the vehicle both stage- and road-worthy. The stage has room for Kevin Kornicki and his drum kit, new Squonk singer Anna Elder, and one of two bassists. 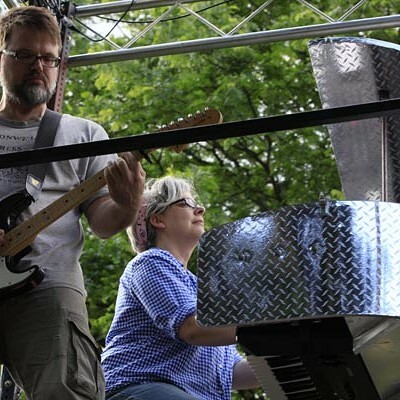 An elevated platform holds guitarist David Wallace as well as Dempsey and her rotating keyboard, which is disguised as a sheet-metal grand piano. 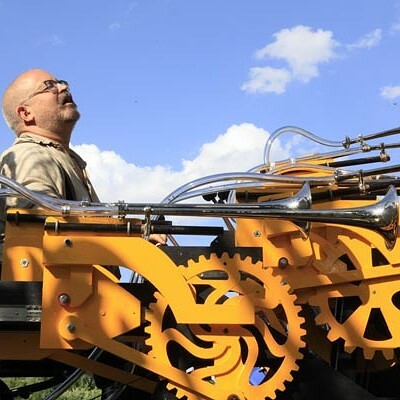 There's a cab-top, bellows-powered, gear-driven truck-horn calliope that Squonk calls a "Gatling trumpet." 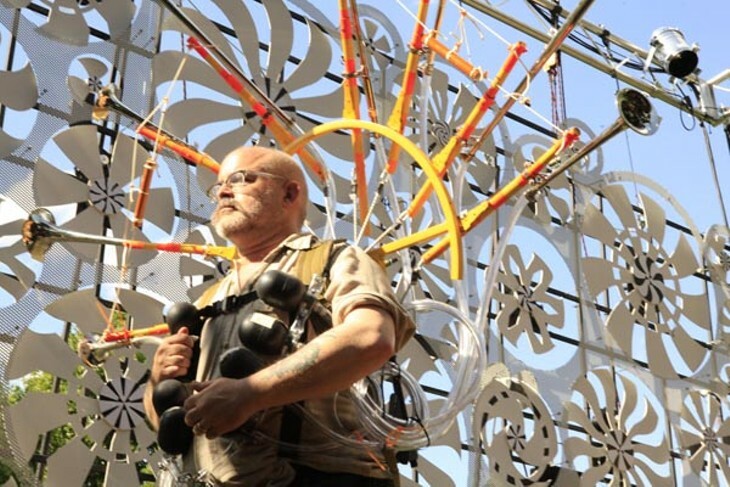 And the stage's rear wall is composed of three dozen pinwheel-style rotors that can spin fast enough to serve as a screen for video projections by artist Jessie Sedon-Essad. That's not to forget the peacock's-tail of trumpets O'Hearn dons, nor the fish-shaped blimp the size of the stage, with a mouth that opens and closes. And it all collapses into a canvas-walled box truck you don't even need a special license to drive. GO, says chief production-designer O'Hearn, is "briefer and louder" than most Squonk offerings. It begins with a miniature marching-band procession, complete with tuba, glockenspiel and bass drum, with musicians including members of the tech crew. The costumes include road-crew hardhats mounted with megaphone, emergency light or deer antlers. O'Hearn says that to help atone for the fuel-hungry International, much of the show will be hand-cranked, including the device that spins the piano. But the lights and rotor-wall requires a generator, and so to be heard, GO's 11 songs will be on the boisterous side, says composer Dempsey, with fewer unusual time signatures. "This is making us play 4/4 for the first time," quips O'Hearn, who plays horns. It's also Squonk's first foray into audience participation, with percussion opportunities for kids. Which seems appropriate for the skilled yet artistically rammy Squonk crew. "Just remember," guest choreographer Beth Corning reminds the troupe during a recent rehearsal for GO, "it should have this feeling of kids in the backyard."